Lately I’ve seen photos of some really cool “surprise inside” cakes. They look just like regular cakes on the outside, but when you cut into them a pretty pattern is revealed. There have been checkers, hearts, shamrocks, zebra stripes, and my favourite – spots. I fell in love with a multi-coloured polka dot cake, and another one with ladybirds spots inside. I was fascinated by these cakes, and wanted to learn the secret. There’s a tutorial on how to create the dots using a cake pop baking tray at Once Upon a Pedestal, but I don’t have one of those. Or you can buy the specific ladybird tutorial on Etsy, which would be handy, but I was trying to avoid forking out money (yeh, I’m being stingey!). 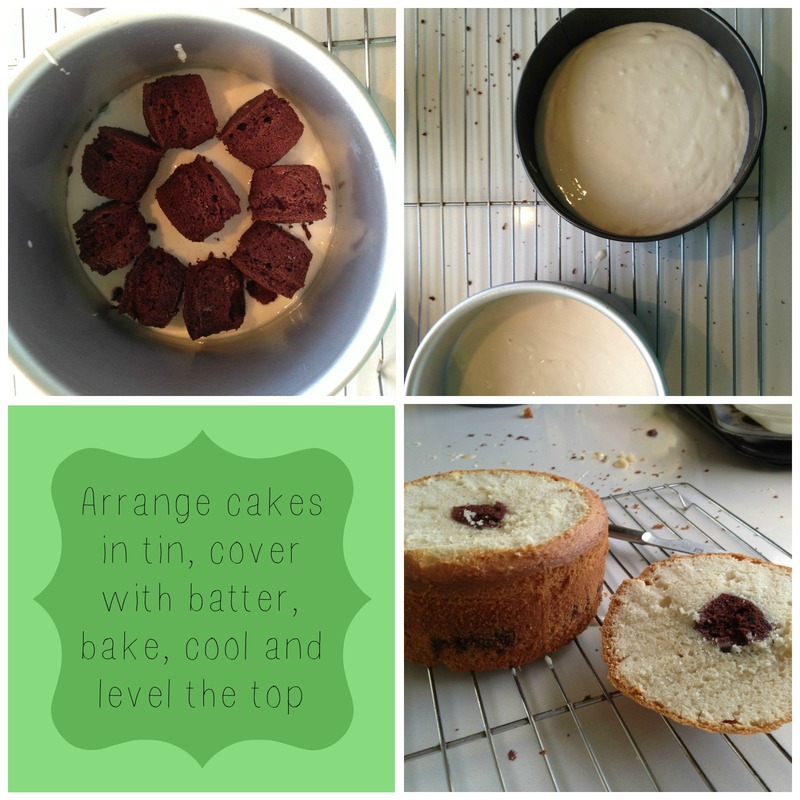 Then I found a great tutorial at Beki Cooks Cakes. What I loved about this tutorial was that Beki told us all about her failures, as well as the method that finally worked, so we can learn from her mistakes! So I had a practice run to see if I could get the same effect. I cheated and used packet mix (ssshh, don’ tell anyone! 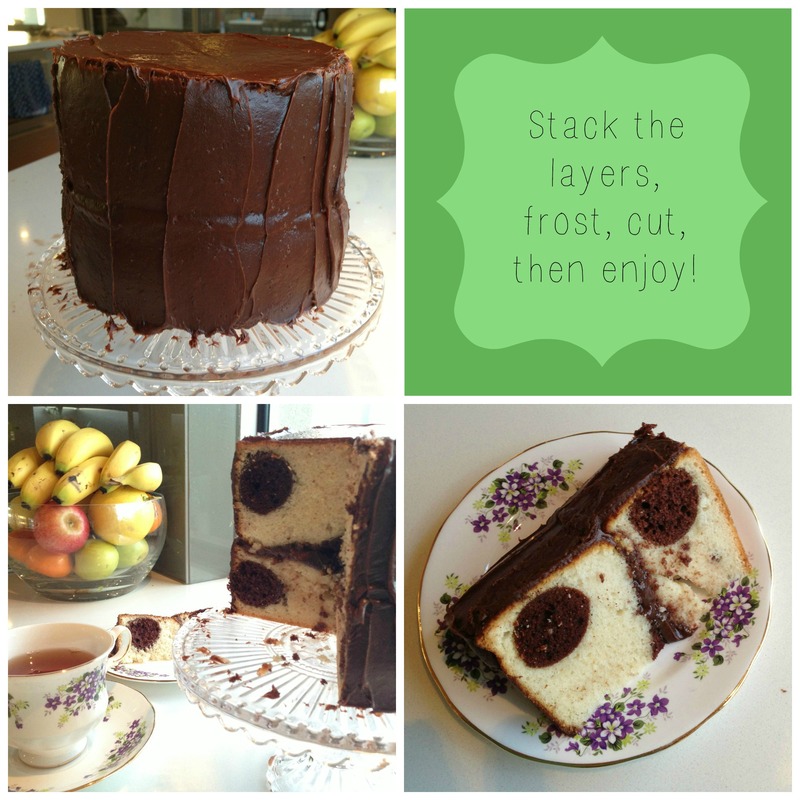 ), using chocolate for the spots, and vanilla for the surrounding cake. 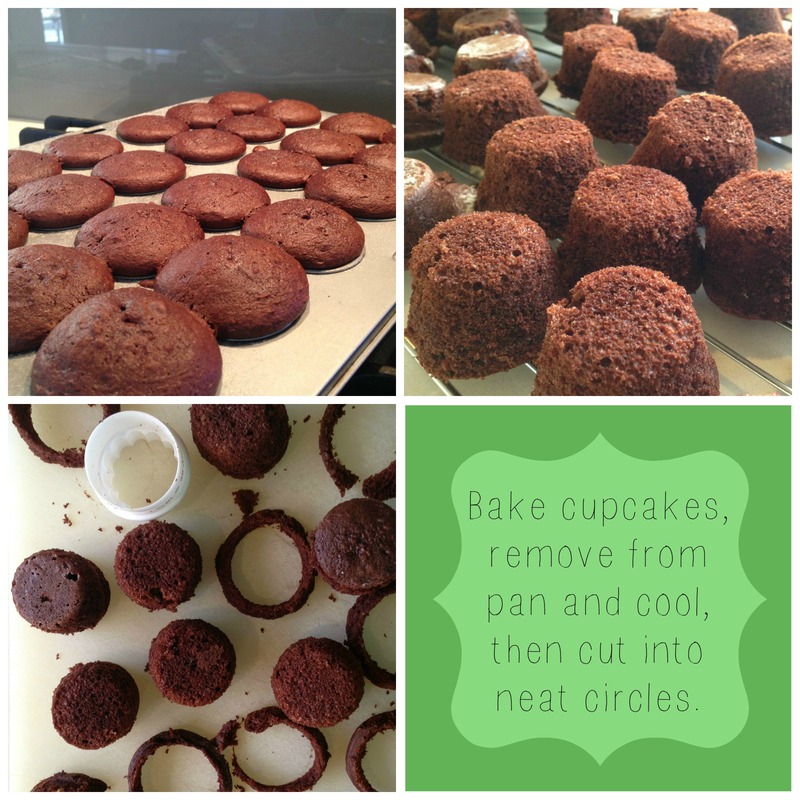 Step Two- Once cooled, I cut the cupcakes into neat 1 1/2 inch circles using a cookie cutter. Step Three- I poured a bit of the vanilla batter into the bottom of my prepared cake tins, although you possibly don’t need to do that. Then I carefully placed the trimmed cupcakes into the cake tins, and poured the remaining batter over the top. Step Four- bake (don’t try and shake it out of the tin while it’s still gooey inside – ah hem! ), cool, level off the tops, construct and frost. Step Five- cut into it and go ‘Ooooh’! Yay, it worked. Now I’m feeling a little more confident about trying to make the ladybird cake for my nieces second birthday. Stay tuned!